I do not know if one can properly speak of travel watches becoming fashionable; though as a juror for the Grand Prix d’Horlogerie de Genève (GPHG), an awards that aims to reflect what is going on in the watch world, I’ve noticed a new “Travel Time” category has been instituted this year. And SalonQP, the Telegraph-sponsored luxury watch show opening at the Saatchi Gallery on Thursday, will itself be hosting a special exhibition of new and historic travel-time watches. Nevertheless, assertions such as “World Time watches are the new chronographs” have a cumbersome and uninviting quality to them, and would not be entirely true: there is the fact that travel-time watches were around before such arriviste complications as the chronograph, before most of the means of travel that we use today, and indeed before the time zone itself. Typical of what your 18th-century pre-jetsetter would have favoured to tell the time in different locations was the World Time Bonbonniere, made in about 1790, attributed to Pierre Morand and now in the Patek Philippe Museum; it has the names of 53 different locations engraved around a 24-hour dial. The Beyer Museum in Zurich has one made by Rouzier and Melly from about the same time, and were it entered into the GPHG today I would give it full marks for decorative effect – but as to its usefulness to its 18th-century wearer, I would be less convinced. Back in the late 18th century, when the fastest man travelled was as rapidly as horse or sail could take him, jetlag and the whole “lunch in London, dinner in Dubai, breakfast in Beijing” pace of life were not an issue. In other words, such timepieces were for demonstrating technical skill on the part of the watchmaker and the cosmopolitan outlook of the wearer. Looked at in that light, not too much has changed in the course of the past two and a quarter centuries. Of course, travel has changed somewhat, and with it the demands made on watches. The need for trains to run on time – one single time, that is – caused the British to adopt GMT as the standard time. Things were rather more complicated in the United States, where there were dozens of different times; but the International Meridian Conference of 1884 simplified things, giving us the time zone structure that, ever since, has kept watchmakers busy interpreting the need to tell the time in other parts of the world, much as different artists interpret the same subject in different ways. The most famous was, of course, Rolex’s GMT Master with 24-hour rotating bezel. Made for Pan Am pilots of the Catch Me If You Can era, some early examples of the Ref 6542 with the original, and very fragile, Bakelite bezel are now making six-figure sums at auction as collectors, either bored with or priced out of Daytonas, switch attention to GMTs. I love the Rolex GMT and its connotations of the early jetset, when air travel was glamorous rather than grim, but for me the most elegant solution was that of Louis Cottier, a talented Geneva watchmaker, who developed a system that showed the time simultaneously in several world cities. It is possible to trace the evolution of Cottier’s system through various historic Patek Philippe models, featuring first the city names on a fixed bezel, and later a moving city bezel activated by a second crown at 9 o'clock, and later by a pusher at 10. Recently Patek has revisited this classic, which returns as the Ref 5230, with a few changes to the time zone cities themselves, reflecting Moscow’s switch to a new time zone and replacing Rio with Buenos Aires. The brand new Ref 5930, meanwhile, is a particularly satisfying integration of chronograph and world time functions. The chronograph adapts itself subtly to the familiar architecture of the world time to create a handsome watch. Cottier, who died 50 years ago this year, would quickly recognise his original concept in these elegantly proportioned models. But Patek Philippe was not the only marque to benefit from his genius. Vacheron Constantin’s archives have examples of his work and, given its name, it was inevitable that the Overseas bracelet watch collection, which relaunched this year, would feature a travel time. Vacheron prides itself on a system that takes into account those fiddly half- and quarterhour time zones you never knew existed, such as the Chatham Islands – which, I am informed, are somewhere off New Zealand. Quite how many Vacheron customers are going to make it to the Chatham Islands I am not sure, but when they do they will know what time it is. This display is attractive too, and as a useful aide-memoire a map of the world located in the centre grows light and dark to give a visual picture of whether it is day or night in any given part of the world. 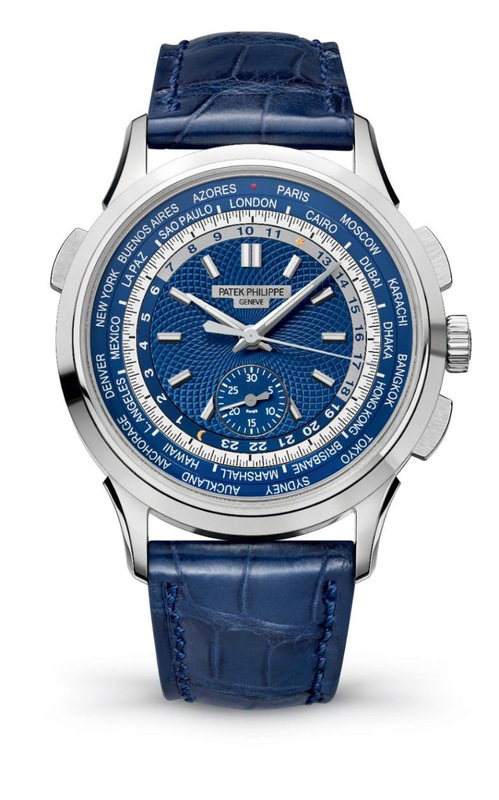 A world map of some sort is a much cherished part of the iconography of the world-time watch; Patek Philippe’s Heures Universelles models with their delicate cloisonné enamel dials depicting parts of the globe are miniature masterpieces, works of art for the wrist. But costly and painstaking enamelwork is not the only way in which this effect can be achieved these days. Jaeger-LeCoultre’s Geophysic Universal Time combines sunburst engraving and graduated blue lacquer on its dial, while Montblanc plays with a multilayer sapphire crystal dial construction on its Orbis Terrarum. The Hamburg-based, pen-turnedwatchmaker even offers what I’m calling a Brexit edition which, instead of the green and brown of cartographical custom, picks out the entire northern hemisphere with the Union Jack. Limited to just five watches, it launches at SalonQP this week. (My advice, though, would to be wear something different if travelling to Brussels.) Montblanc’s world timers offer good value, as do those of Ball Watch Company, with a straightforward, modern take on the Cottier system, plus a day and date. Rather more playful is Louis Vuitton’s Escale Time Zone. As a travel brand, Vuitton probably assumed that its customers had had enough of looking at maps and instead it presents them with the traditional outer bezel bearing abbreviated names associated with 24 time zones, intersticed with little coloured pennant-like designs. I was with Hamdi Chatti, vice president of watches and jewellery at Louis Vuitton, when the idea for these bright little geometric patterns came to him. We were in the Vuitton archives and as you might have predicted we were looking at some old luggage. In the past Vuitton’s customers use to paint their luggage with coloured emblems so it would stand out on the quayside or railway platform. The sight of so many of them gave him the idea. The dials are hand-printed using the traditional decalquage method with numerous applications of colour to build up the intensity. Also pleasingly geometric, albeit more sober, is L.U.C Chopard’s Time Traveller One design, launched in London earlier this month, which emphasises the role of rotating bezels in this type of display. It is finished to the exacting standards for which Karl-Friedrich Scheufele is renowned; by dispensing with maps and eschewing fancy colours he has created a watch that is both masculine and subtle. The concentric arrangement of functions is also a feature of the design of De Bethune’s DB25 World Traveller, which maximises the design potential of the travel watch by offering both GMT and world time functions. In order to give the chosen cities greater legibility and more space, they appear in the centre of the dial radiating outwards. The position of these can be altered by a pusher at 8 o’clock, while the GMT indication is a small sphere that turns from light to dark as it navigates a circular channel, beyond which is the traditional 12-hour dial and then, at the very edge, a date ring. The representation of the city names in this form is easier to read, but it does make for a larger watch, 45mm in this case. 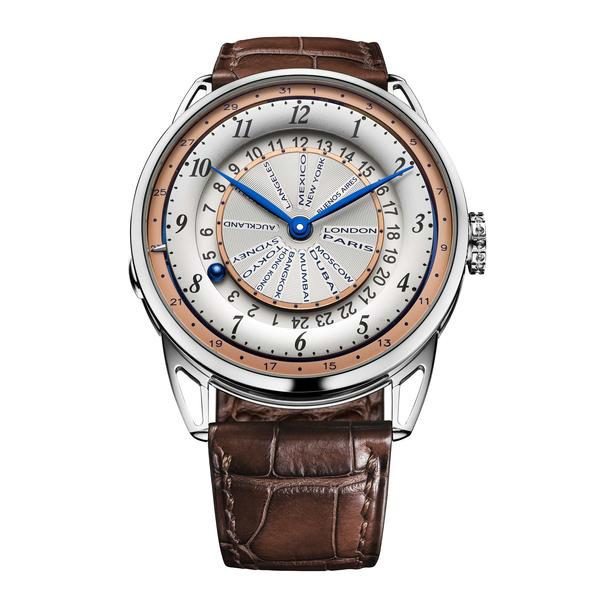 Taking this into account when it attempted the same sort of city display, Montblanc opted for a pocket watch of 53mm in order to be able to put the names in full “sun ray” style. The effect is gracious and strongly reminiscent, in appearance, of the 18th-century watch in the Beyer collection. Who knows, perhaps next year’s Grand Prix d’Horlogerie de Genève will feature a section devoted to GMT pocket watches.